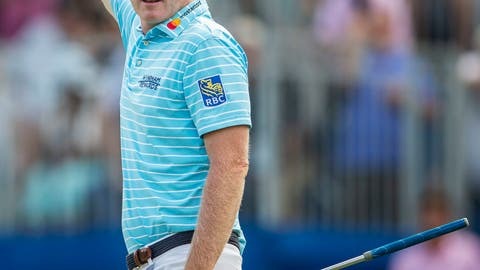 GREENSBORO, N.C. (AP) — Brandt Snedeker couldn’t block out the buzz that surrounded his first-round 11-under 59 at the Wyndham Championship. He refocused just in time to reclaim the lead. Snedeker followed his historic opening score with a 67 on Friday to take a two-stroke lead into the weekend at the Wyndham Championship. Snedeker, the 2012 FedEx Cup champion, won this tournament in 2007 before it moved across town to the par-70 Sedgefield Country Club. He had the tour’s first 59 of the year during the first round. But it wasn’t easy to follow a score like that. Of the nine previous players who have broken 60 on the tour, six had to play the next day and only one has shot better than 65 in that round: Justin Thomas, who had a 64 in the second round of last year’s Sony Open. By the time Snedeker teed off Friday afternoon, that low score had held up for a one-stroke lead. It temporarily slipped away when he had three bogeys on the front nine. He reclaimed the lead late in his round with some nifty putting. He sank two putts longer than 30 feet, one for eagle on the par-5 15th and another for birdie on the par-4 16th, and wrapped up with the best two-round score at this tournament since Carl Pettersson’s 125 a decade ago. Points, who has made only one cut since January and failed to reach the weekend in 19 of his 24 tournaments this season, had a strong front nine with three birdies and an eagle on the par-5 fifth hole, where he sank a 40-foot putt. He has finished in the top 20 at this tournament twice since 2014, and after starting far off the bubble at No. 214 on the points list, could play his way into the playoffs this weekend. Pan, a 26-year-old from Taiwan, had birdies on three of his final four holes to climb the leaderboard. He sank a 20-foot birdie putt on No. 17 and an 8-footer on the 18th to match the best round of his young career. He also shot 64s last year at the Travelers Championship and the RSM Classic. Among the other highlights: Brian Gay had the day’s best round, a 63 tarnished only by a bogey on his final hole on which he missed a 4-foot par putt. And Mitchell opened with five consecutive birdies to briefly raise the possibility of a second sub-60 score in two days, before slipping back later in his round. A key subplot at Sedgefield every year is the push by bubble players to earn postseason spots. The top 125 players on the points list make the field for the Northern Trust in New Jersey, and everyone from No. 122 to No. 132 is playing this weekend. Bill Haas, who at No. 150 is in danger of missing the playoffs for the first time, made the cut at 3 under. Garcia, at No. 131, also is trying to make it for the 12th straight year. Johnathan Byrd — who at No. 183 probably needs to win or finish alone in second place to earn enough points to qualify — remains in the mix at 8 under.